BRISTOL SHOW 2011: PMC brings Bryston BDP-1 digital music player to the UK | What Hi-Fi? 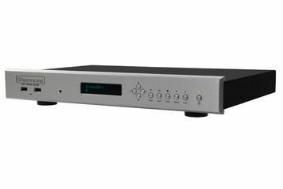 The £2300 BDP-1 is designed for playback of high-definition music files directly from a USB storage device, and acts as a companion to the Bryston BDA-1 DAC (digital-to-analogue converter). There's no internal DAC, hard drive, streamer or CD ripper, so it connects to an external DAC for playback through AES-EBU or BNC digital outputs. Control is via simple front panel buttons, similar to those found on a CD player, and the unit can also be connected via its Ethernet port to a home network. Do so, and you'll be able to control it from your PC, Mac, iPhone, iPad or other smartphone using the Bryston-Mini and Bryston-max web apps, which allow the creation of personalised playlists. An optional iPad/iPhone/iPod app is also available for download from the Apple App Store. However, linking the BDP-1 to your home network won't allow streaming of music from other devices. Music is always accessed from the locally connected USB storage device, says Bryston, "to eliminate the challenges associated with streaming large, high-resolution audio files over a home network". Up to four USB devices can be attached to the BDP-1, with two USB ports on the rear and two on the front. Music files up to 24-bit/192kHz resolution are supported, as well as FLAC, AIFF, WAV, MP3, M4A, WMA and WMV files. A Linux operating system, "industrial grade" motherboards and Bryston-modified soundcard deliver "outstanding performance for the music aficionado", the company claims.